Hello and welcome! I'm not really good, as you can tell, with keeping this up. But I really want to try and do it regularly. This week was a bit chaotic because my daughter was sick on two of the days that she and her brother are at daycare, meaning she couldn't go and meaning I had no time to do this... But now I do :) Yay. So, Let's get started. First things first - I'll show you what I've done with the new Spring/Summer Catalogue and Sale-A-Bration items that I have. Here I recreated the image they have in the catalogue with this stamp set. It's so beautiful, I just had to case it, and case it I did. There are very few differences with the one in the catalogue honestly. Anyways, this is the Celebrate Today Stamp set and I bundled it with the framelits as well. Also did this one. These are in the Best Year Ever colours, Crushes Curry, Calypso Coral and Coastal Cabana. Every time I write those out I wonder if they just put all the colours with a C at the beginning together and thought, well these actually look nice together. haha. Well, Sahara Sand and Soft Suede are also in there. I used Kraft paper (non SU :-O) as the base and stamped it with Craft Ink. Used some candy dots to add dimension and there you have it! Here we have a double slider card using the Sheltering Tree stampset. I tried to do what they did in the catalogue with cutting up the leaves so that you can see the tree underneath, but it didn't work very well. Here I made some bookmarks using the Celebrate Today stampset. I also used some non SU stampsets, the new Sale-A-Bration stamp set Simply Wonderful and I used the free ribbon from the Best Year Ever Accessories pack. I love the colours and I use them a lot more often. Something else I used is the Orange glitter which is on sale now in the clearance rack (together with black glitter, from Halloween) This gives a great autumny look. 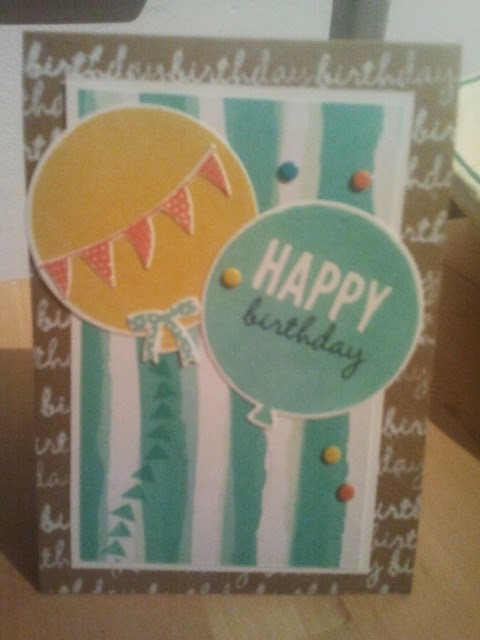 This is a card using the Best Year Ever Paper Pack from Sale-A-Bration and the paper in those colours. I love, love, love these colours. So great. And I made some waterfall cards. LOVE waterfall cards. Not hard to make (though it uses a lot of paper) and super WOW value. Here I used various stamp sets including some non SU stamps. I used: Zoo babies, Simply Wonderful, Bravo and Little Sunshine. Three of them have no base card yet but I just haven't had the time to adhere them. Right, that was a lot but I hope you got through it and enjoyed. Next time I won't take so long to post!